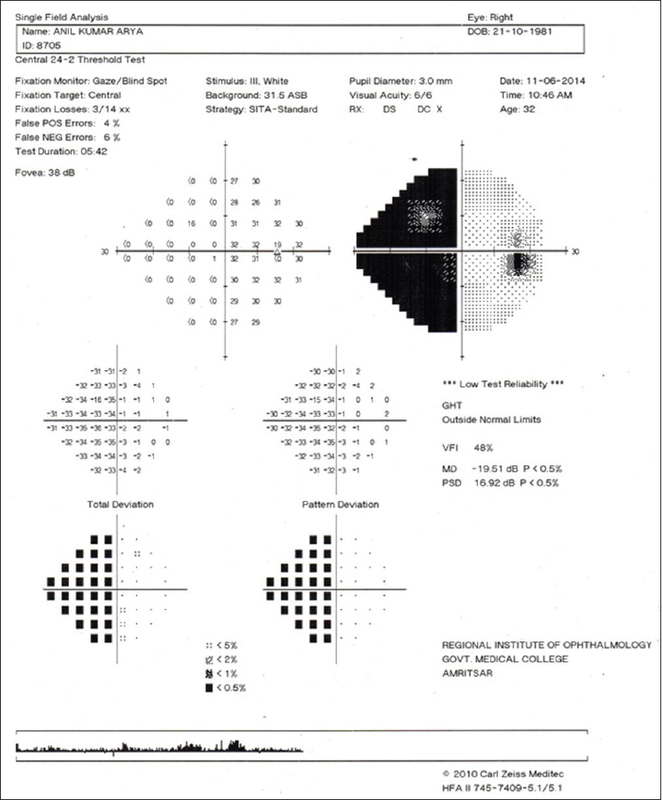 Visual field (VF) testing is an important diagnostic tool for Glaucoma. The current gold standard for VF testing is automated perimetry. This article is an attempt to familiarize the reader with components of an achromatic (white on white) automated perimetry printout. It addresses use of Humphrey perimeter to interpret the results. For the purpose of this review, a PubMed search was made using perimetry, Humphrey VFs review as key words and the relevant articles were studied. The references appended with these articles were also analyzed, and any appropriate article was also included. A systematic approach has been outlined that results in a thorough interpretation of the printout. One should be able to identify a normal field and establish glaucomatous progression, detect the presence of a field defect, determine whether it is due to glaucoma or neuro-ophthalmic disease if any. Comprehensive evaluation using clinical examination, tonometry, and perimetry should be considered together to make a proper diagnosis of glaucoma and judge its progression over time. INTRODUCTION: Blepharitis and meibomian gland dysfunction are chronic inflammatory conditions with overlapping pathophysiology and symptomatology. Both microbial infection and seborrhea contribute to the pathophysiology and both may benefit from treatment with tea tree oil (TTO). We evaluated the therapeutic effect of eyelids scrubbing with TTO in a group of patients with lid margin disease. MATERIALS AND METHODS: Forty patients were recruited. Half of them received lid scrubbing with a TTO formula (Naviblef™) and the other half was treated by massage and cleansing. The effect on ocular surface symptoms, tear film stability, and lid signs was evaluated. RESULTS: All patients receiving TTO improved in symptoms, signs, and tear film stability, and the improvement was statistically significant at P < 0.001. 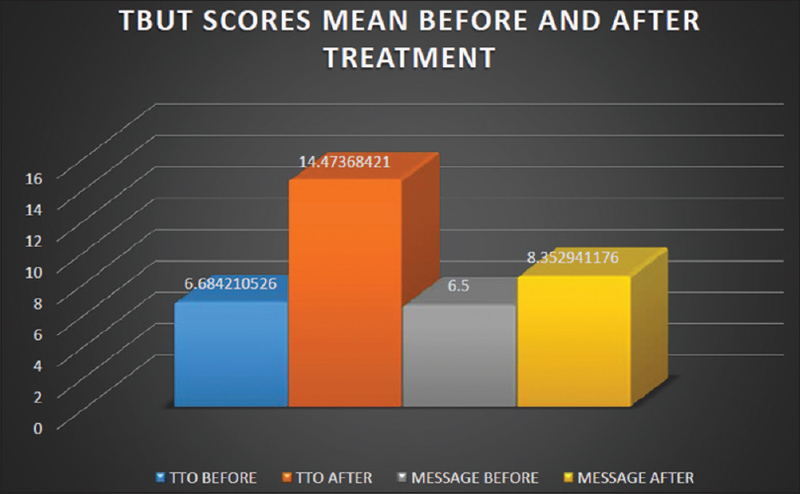 Only five patients in massage group showed improvement. The changes in massage group were not statistically significant at P < 0.001. TTO is very effective in relieving symptoms and improving tear film stability and lid signs. BACKGROUND: Analysis of safety and efficacy of self-engineered polymethylmethacrylate (Acry C) implants in nonpenetrating glaucoma surgery (NPGS) for control and maintenance of intraocular pressure (IOP) in primary open angle glaucoma (POAG) patients. MATERIALS AND METHODS: This was a hospital-based randomized study. Fifty eyes of 50 POAG patients were divided into 3 groups based on preoperative IOP range. NPGS was done with polymethylmethacrylate implants made from haptics of intraocular lenses. All patients were followed up after 1 day, 1 week, 1 month, 3 months, 6 months, and 12 months. Preoperative IOP range was from 25.62 ± 1.72 to 41.66 ± 1.15 mmHg. Postoperative success was defined as IOP <21 mmHg at 1 month in the absence of additional antiglaucoma medication or other treatment. RESULTS: A significant reduction in IOP was observed postsurgery in all three groups, changing from a preoperative mean of 25.62 ± 1.72 mmHg, 34.38 ± 2.27 mmHg, and 41.66 ± 1.15 mmHg to a postoperative mean of 13.27 ± 2.13 mmHg, 16.50 ± 2.74 mmHg, and 17.66 ± 1.52 mmHg, respectively (P < 0.001) at 12 months. No significant difference was seen with change in position of the implant, i.e., convexity facing limbus or fornix. No intraoperative complications were observed. The main postoperative complication was failure of filtration in 1 case (3.44%) from Group 1, 5 cases (27.78%) from Group 2, and all 3 cases (100%) from Group 3 at 1 month postoperatively. Thus, 9 eyes (41%) required postoperative antiglaucoma medications following which the IOP was controlled. CONCLUSION: NPGS with Acry-C implants is a safe and cost-effective (<1 US dollar) procedure for control of IOP in POAG patients especially those with moderately elevated IOPs. PURPOSE: To analyze varying clinical presentations, histopathological features, and management outcome of sebaceous gland carcinoma (SGC) of the eyelid. MATERIALS AND METHODS: We retrospectively reviewed medical records of 30 patients with histologically proven cases of SGC of eyelid treated at tertiary care hospital. RESULTS: Patients were in the age group of 28–80 years, among which 18 (60%) were females and 12 (40%) were males. Mean follow-up period was 29.83 ± 8.14 months. Six out of 30 cases were lost to follow-up; hence, only 24 cases were analyzed for reconstruction techniques and management outcome. 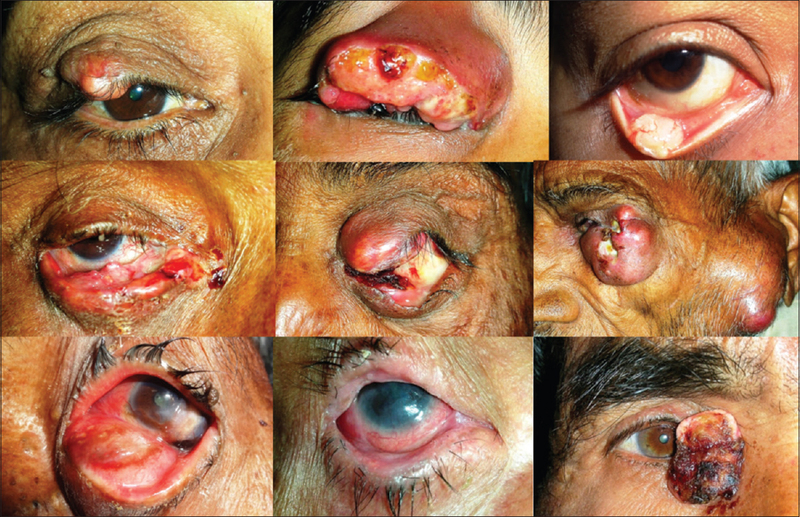 Initial anatomic sites involved were upper eyelid (10 cases [33.33%]), lower eyelid (5 cases [16.66%]), both upper and lower eyelid (10 cases [33.33%]), and medial canthus (1 case [3.33%]). Orbital extension at presentation was present in 4 cases (13.33%) while metastasis to preauricular lymph nodes was seen in 1 case (3.33%). T2 was the most common category according to TNM staging (14, 58.33%). Reconstruction techniques included direct closure with or without cantholysis in 5 (20.83%), closure with Tenzel's semicircular flap in 2 (8.33%), Cutler Beard repair in 5 (20.83%), and Hughes's flap with either cheek advancement flap or full-thickness skin graft in 3 (12.5%). Both upper eyelid and lower eyelid repair were done in three (12.5%) cases and medial canthal repair in one (4.16%) case. Five (20.83%) cases underwent exenteration. On histopathological examination, 23 (95.83%) patients had localized tumors while only 1 (4.16%) patient had pagetoid invasion. Recurrence was observed in three (12.5%) cases. One (4.16%) case died subsequent to brain metastasis. CONCLUSION: SGC of eyelid may have varied presentations, but early diagnosis and consequent surgical therapy has good outcome and higher survival rate. PURPOSE: The purpose of this to investigate whether selective laser trabeculoplasty (SLT) has any effect on the success of trabeculectomy. 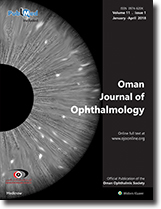 PATIENTS AND METHODS: Thirteen-one eyes of 29 primary open-angle glaucoma patients who underwent SLT before trabeculectomy and 29 eyes of 27 patients with the same inclusion criteria which underwent trabeculectomy without prior SLT in the Sifa University and in the Batigöz Eye Hospital in January 2012 and November 2012 were reviewed. 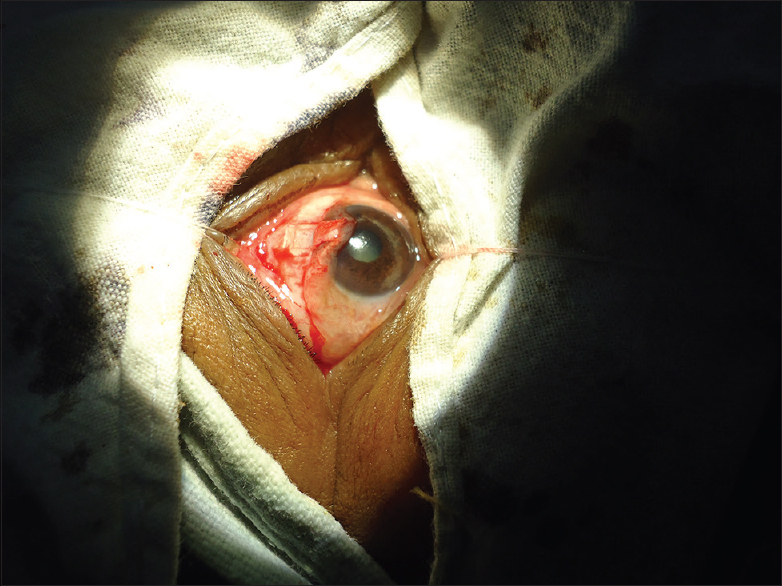 All patients underwent trabeculectomy for uncontrolled open-angle glaucoma with the same technique. The results were evaluated 3, 6, 12, 18, and 24 months later after surgery. The statistical analysis was performed with the Mann–Whitney U-test. Fisher's Exact Chi-square test was used to compare the continuous and categorical variables. RESULTS: The mean intraocular pressure (IOP) before surgery was 24.1 ± 1.9 in the SLT-performed group and 26.7 ± 1.6 in the non-SLT-performed group. Twenty-four months later, the mean IOP was 15.1 ± 1.2 in the SLT-performed group and 15.4 ± 1.4 in the non-SLT performed group. There was no difference in the IOP drop after trabeculectomy between the two groups (P = 0.531). CONCLUSIONS: SLT has no influence on trabeculectomy success. PURPOSE: The purpose of this study was to determine the incidence, severity, and associated risk factors of retinopathy of prematurity (ROP) in a district in South India. METHODS: This was a prospective, observational, cohort study involving babies at risk of ROP conducted in five Neonatal Intensive Care Units in a district in Tamil Nadu, South India. All babies with gestational age at birth of ≤36 weeks and a birth weight (BW) of ≤1900 g with a follow-up period of at least 6 months were enrolled for the study. Neonatal and maternal risk factors were assessed and univariate and multivariate logistic regression analysis performed to examine the predictors of ROP. RESULTS: A total of 325 infants were screened. 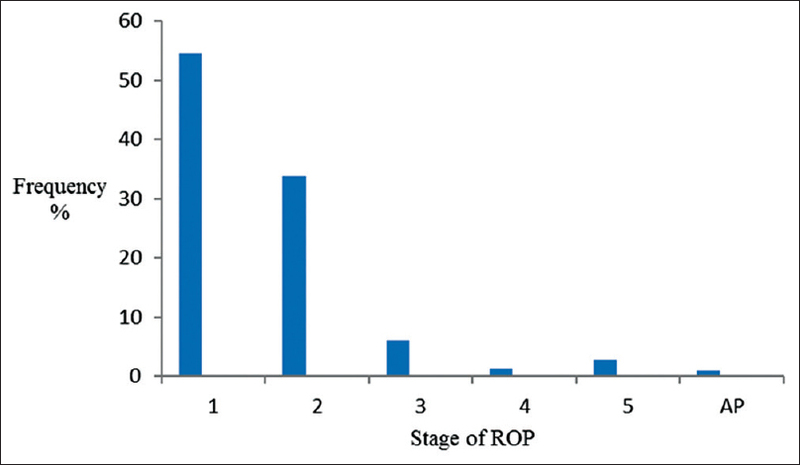 ROP was identified in 210 eyes of 106 (32.6%) babies with severe ROP (stage ≥3 ROP) occurring in 14 (13.2%) babies. Low BW (LBW) was the only significant risk factor for ROP on multivariate logistic regression analysis. The mean BW was 1285 and 1452 g for babies with and without ROP, respectively. 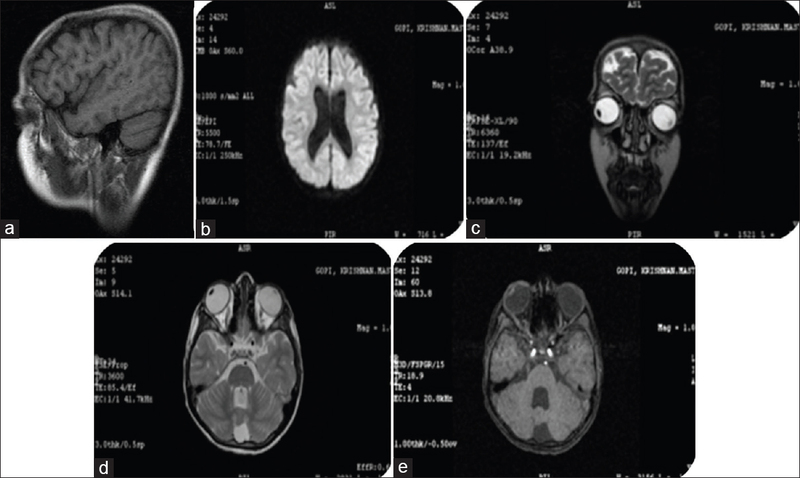 Treatment was indicated in 22 eyes of 14 (13.2%) infants. CONCLUSIONS: The incidence of ROP was fairly high and strongly associated with LBW. A relatively low incidence of severe ROP was, however, observed. More effort is, therefore, required towards the prevention of preterm births while the present gains in neonatal care should be sustained to reduce the incidence of ROP and thus childhood blindness in the country. BACKGROUND/AIMS: Choroidal thickness measurements are reported to differ between spectral-domain optical coherence tomography (SD-OCT) and swept-source OCT (SS-OCT). The aim of this study was to assess the comparability of choroidal thickness measurements using SS-OCT and SD-OCT devices among normal participants. MATERIALS AND METHODS: This was a prospective study of 31 (62 eyes) normal participants. Choroidal imaging was performed sequentially with the Spectralis OCT (SD-OCT) and the deep range imaging OCT (DRI OCT-1) (SS-OCT) using standardized imaging protocols. 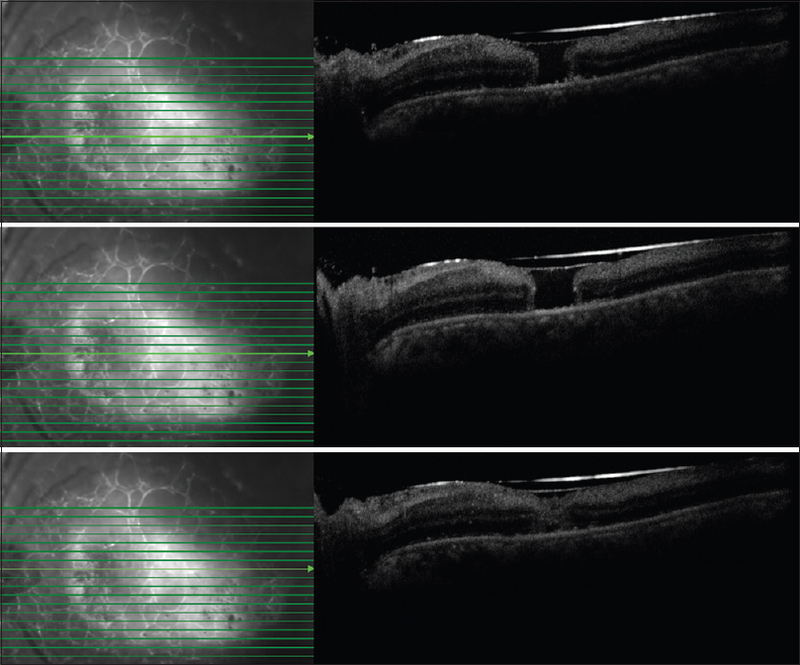 The subfoveal choroidal thickness (SFChT) was measured manually by two masked retinal specialists. Paired t-tests and intraclass correlation coefficients (ICCs) were used to compare the measurements. RESULTS: The mean SFChT was 319.5 μm and 325.3 μm for DRI OCT-1 and Spectralis OCT, respectively (P = 0.001), with a mean difference of 5.9 with ICC of 0.97. The mean difference in choroidal thickness between the OCT devices was larger among eyes with choroidal thickness > 350 μm compared with eyes with thinner choroids (8.0 μm vs. 4.7 μm). CONCLUSIONS: SFChT measurements are comparable between DRI OCT-1 and Spectralis OCT. The variability between the devices increases in thicker choroids. 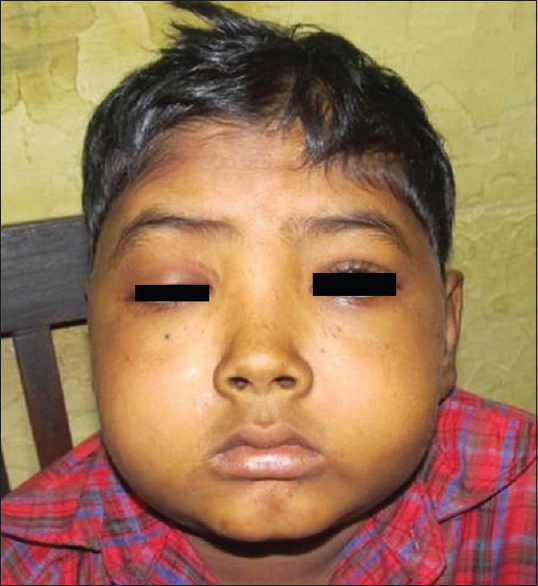 In this report, we present a case of Purtscher-like retinopathy in a 12-year-old male child with nephrotic syndrome. 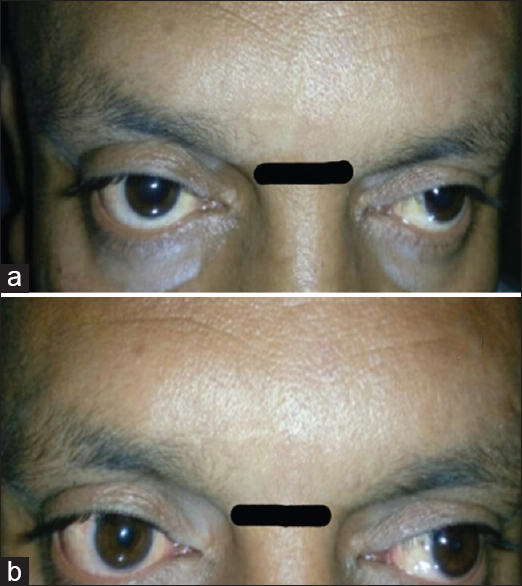 He was a known case of steroid-dependent nephrotic syndrome, frequent relapser with spontaneous bacterial peritonitis, who presented with complaints of difficulty in vision in both eyes. The fundus examination showed multiple cotton-wool spots and Purtscher fleckens centered around the optic nerve head with superficial retinal hemorrhages in both eyes. Fluorescein angiography confirmed the diagnosis of Purtscher-like retinopathy. 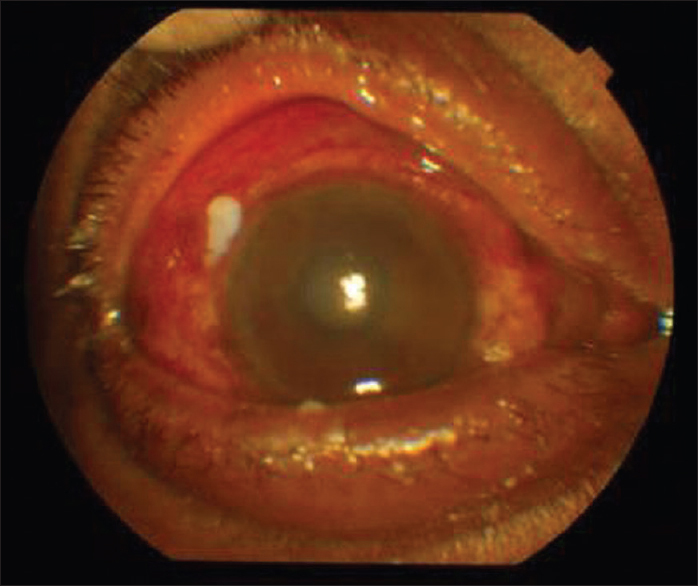 Pseudo-phakic pupillary block glaucoma in postoperative period may mimic acute endophthalmitis. This article illustrates how clinical differentiation of pseudo-phakic pupillary block glaucoma from postoperative acute endophthalmitis was done as ultrasonography produced confusing results. Sympathetic ophthalmia is an ocular inflammatory disease commonly associated with penetrating trauma. 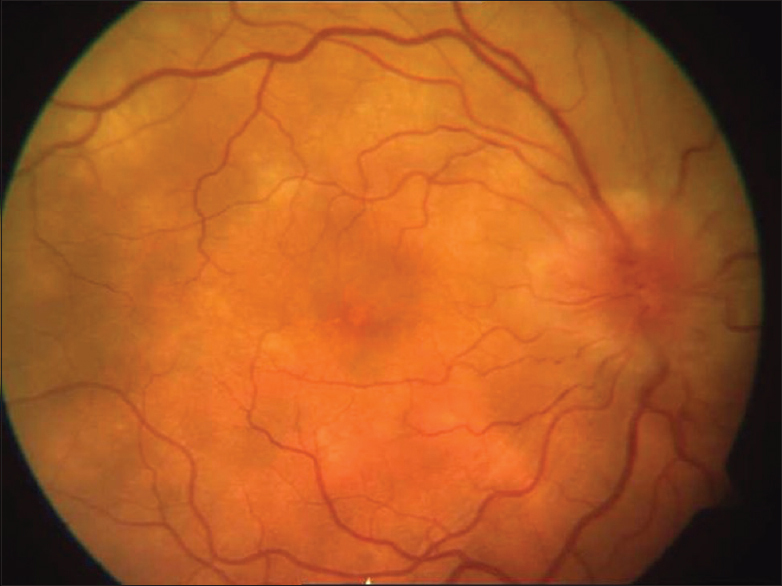 We report a case of sympathetic ophthalmia who had Dalen-Fuchs nodules on presentation and developed a frosted branch angiitis (FBA)-like picture which is not a known feature of this disease. 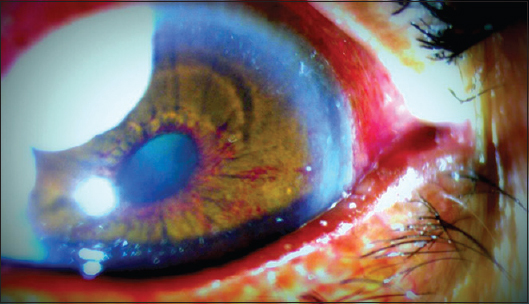 A 25-year-old male patient was seen 8 months following penetrating trauma to the left eye. He was treated with oral steroids and immunosuppressives. Fundus fluorescein angiography confirmed the presence of perivascular retinitis; optical coherence tomography showed retinal thickening and ultrasonography showed peripapillary choroidal thickening. Atypical features such as FBA in cases of sympathetic ophthalmia can be present and can indicate an ongoing active inflammation. Early aggressive management is required to prevent visual morbidity. We report an unusual case of granulomatous inflammation that presented adjacent to bleb 3 weeks postoperatively after combined phacoemulsification and trabeculectomy surgery with mitomycin-C due to retained microfragments of methyl cellulose sponge. The commonly used antimetabolite delivery devices are made of cellulose. Methyl cellulose sponges are friable, and they are likely to leave behind microfragments in subconjunctival space. In our case, bleb integrity was maintained, unlike the earlier reported cases which presented with bleb leak. Hence, one should have high index of suspicion in unusual cases of postoperative inflammation not resolving conservatively. 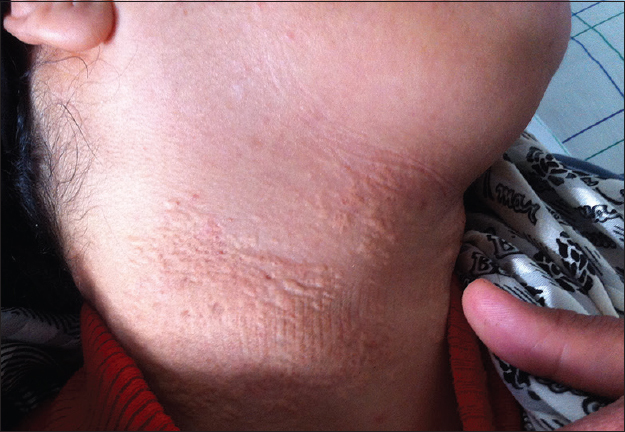 Although rare, retained sponge particles can be a cause of early bleb-related inflammation which can lead to bleb failure. A 14-year-old male teen presented with unilateral episcleritis, unresponsive to topical and systemic corticosteroid therapy, without a history of ocular trauma or evidence for systemic diseases. The presence of foreign bodies in the conjunctival mucus of the hyperemic fornix has been noticed during one of the follow-up examinations. The toxicological analysis of conjunctival mucus revealed the presence of ethylene glycolmonomethyl ether and triethilene glicolebuthyl ether, used as solvents in nail polish removers and all-purpose cleaners. An unexpected etiology of chemical self-inflicted episcleritis was determined. The teen was admitted to a psychological assessment, after which a psychotherapeutic treatment was recommended. Episcleritis is characterized by the acute onset of ocular pain and redness, with a frequent recurrent and stressful course. Since it can be associated with life-threatening systemic vasculitides, a prompt, aggressive immunosuppressive therapy may be considered, both for the ocular inflammation and for the underlying systemic condition. Rarely episcleritis does not improve despite topical and systemic therapy, administered in a stepladder way. The reported teenager case needed a complex multidisciplinary approach to achieve the correct diagnosis and to avoid unnecessary treatments. In the case of recognized “nonsuicidal self-injury,” a psychological evaluation is strongly recommended, to identify and address underlying neuropsychiatric problems. 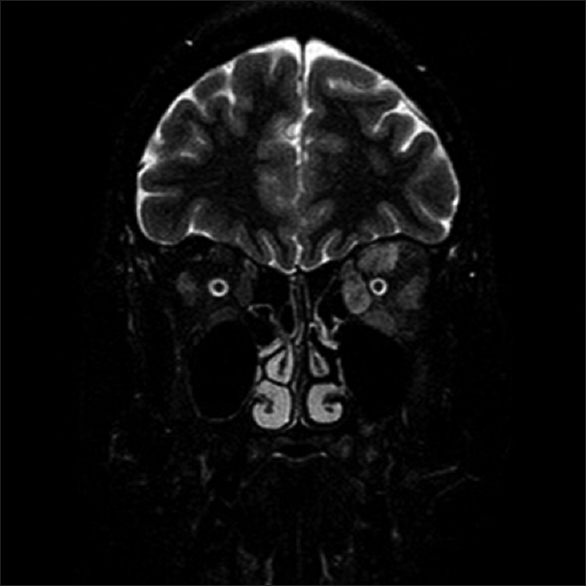 We discuss here an interesting case of strabismus, due to bilateral absent medial rectus muscle associated with brain anomalies, and its surgical management. A 70-year-old patient who underwent uneventful primary implantation of Auro K Pro (a Type I Boston Keratoprosthesis-based device), developed infiltrates in the deep stroma of the carrier corneal graft and exudates on the optic stem of the keratoprosthesis assembly, 6 weeks postoperatively, which subsequently progressed to endophthalmitis. 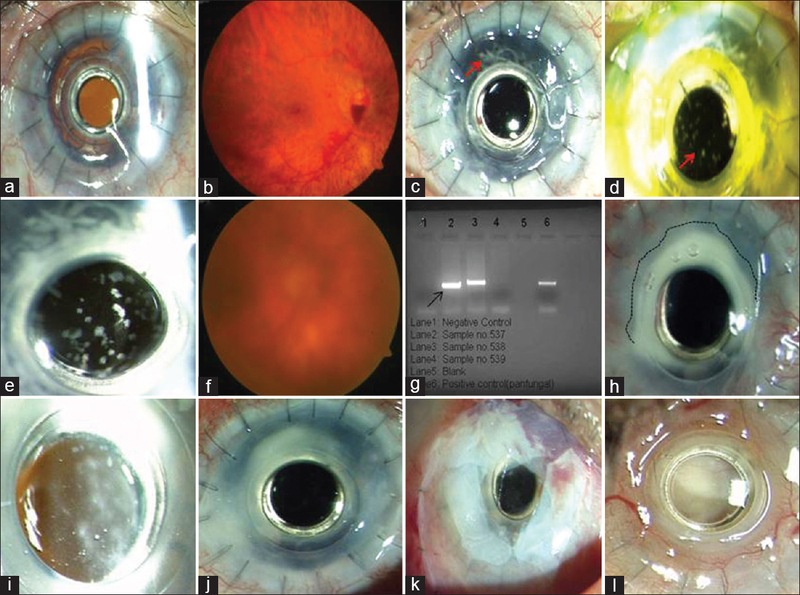 Vitreous tap was positive for a panfungal polymerase chain reaction, although corneal scrapings for both Gram stain and KOH wet mount yielded negative results. Aggressive management with systemic, topical, intravitreal, and intrastromal antifungal agents resulted in an initial resolution, but residual inflammatory vitreous membranes persisted. The patient was then lost to follow-up and presented 3 months later with a total, inoperable retinal detachment. Fungal infections after keratoprosthesis implantation remain a significant concern and may be associated with poor outcomes in the developing countries due to interplay of environmental and socioeconomic factors. Management protocols may need to be modified in accordance with the prevailing conditions in these regions. Orbital involvement in chronic lymphocytic leukemia (CLL) is rare with very few published cases. We describe a case of unilateral isolated extraocular muscle enlargement in a patient with CLL. An incisional biopsy was performed from the left medial rectus muscle and histology revealed a lymphocytic infiltrate suggestive of CLL. Complete resolution of signs and symptoms was subsequently achieved with chemotherapy. We would suggest that in patients presenting with atypical clinical features, it is important to consider nonthyroid-related causes of extraocular muscle enlargement and a muscle biopsy should be considered to exclude neoplastic causes. Large traumatic macular holes (TMHs) tend to be irregular and have a variable predictability. The inverted flap technique makes use of remnants of internal limiting membrane (ILM) at the periphery of the MH. The peeled-off ILM contains Müller cell fragments which can induce gliosis and help in closure of MH. We operated on a case of large TMH (~899 μ minimum linear diameter) with choroidal rupture and subretinal hemorrhage in a young female with the inverted flap technique of ILM peeling and observed successful closure of the MH. The excellent anatomical and surgical results achieved in our case seem to suggest this to be a safe and effective surgical manoeuvre for such cases. The development of a full-thickness macular hole (FTMH) after pars plana vitrectomy (PPV) for rhegmatogenous retinal detachment (RRD) repair is a rare occurrence. We report the first case of rapid MH formation with internal limiting membrane (ILM)-like hyper-reflective bridging membrane under silicone oil (SO) meniscus, noted on the first postoperative day (POD) postvitrectomy for RRD. A 57-year-old man presented with best-corrected visual acuity (BCVA) of perception of light with immature cataract and total RRD in the left eye. He underwent cataract extraction with intraocular lens implantation with uneventful PPV, endolaser to primary break, and 360° periphery followed by injection of 1000 Cst SO. On the first POD, retina was attached in all quadrants with SO in situ. However, a dark red spot was noted at macula which was confirmed as FTMH with a bridging linear hyper-reflectivity under SO meniscus on optical coherence tomography (OCT). Repeat OCT, at 2 weeks and 3 months, revealed closed MH under the SO meniscus with BCVA improving to 6/60. This is the first reported case of very rapid FTMH formation with an ILM-like linear hyper-reflectivity following vitrectomy for RRD and highlights the possible contributory role of multiple nonconventional factors for rapid FTMH development and fibrinous membrane-assisted closure under SO tamponade. 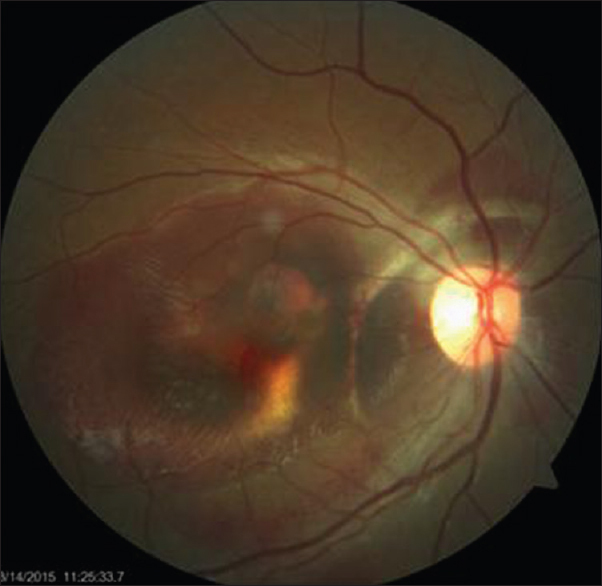 A 34-year-old female a known scleroderma patient presented to us with ocular manifestations in the form choroiditis along with optic nerve involvement. Blood investigations were done, and the ocular findings were confirmed by fundus fluorescein angiography. She was successfully managed with systemic steroid therapy. Among the protean ocular manifestations in scleroderma, only a few cases of choroidal involvement have been reported. Further, clinical and histopathological studies may be needed to throw light on the exact etiopathogenesis. To discuss diagnostic strategies and management options in cases with suspected valsalva maculopathy (VM), to optimize visual outcome. We describe six cases with suspected VM. 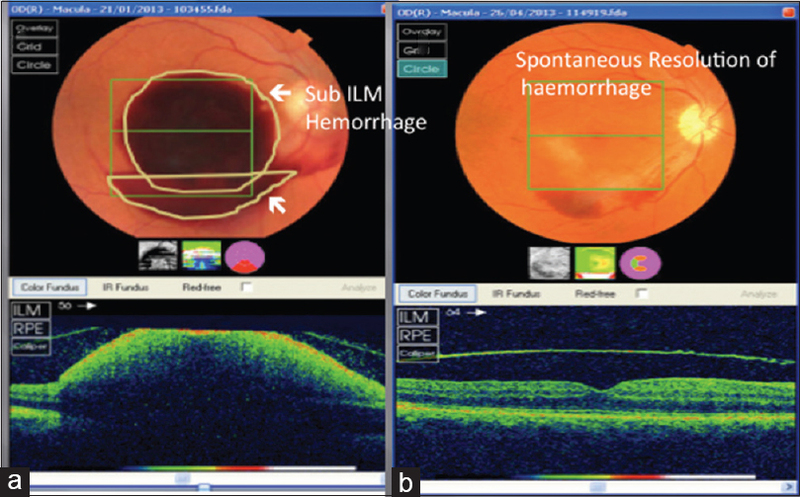 The preretinal hemorrhage resolved spontaneously in four out of six patients, without any intervention. One patient underwent neodymium-doped yttrium aluminum garnet hyaloidotomy and the other proceeded to have a vitrectomy for persistent diffuse vitreous hemorrhage. Considering the evidence available and the outcomes of our patients, we have devised a treatment algorithm for treating VM, which is elaborated in this article. A tonic pupil is usually caused due to parasympathetic denervation of the iris sphincter muscles. It's usually seen in females and in 80 % cases it's unilateral, and 4% of these cases progress to bilateral involvement. Adie's tonic pupil has been reported in literature to have multiple syndromic associations. Simultaneous bilateral occurrence of Adie's tonic pupil in an asymptomatic healthy adult male is sparsely reported in literature. The diagnostic dilemma in the setting of a busy clinical practice is henceforth discussed. Wernicke's Encephalopathy (WE) is a potentially devastating disorder, which if not diagnosed and treated at the earliest, could lead to dangerous neurological and ophthalmological complications. We report the ocular manifestations of WE in a pregnant woman with hyperemesis gravidarum. Pseudoxanthoma elasticum is a hereditary disorder that affects primarily the elastic tissues in the skin, the eyes and the blood vessels. PURPOSE: To report the visual result of Surgery for traumatic macular hole with choroidal rupture running across papillomacular bundle. METHOD: Observation case report Patient 20 year old male patient presented with acute vison loss in OS with BCVA reduced to 20/80 following blunt trauma. Examination revealed full thickness macular hole with choroidal rupture between disc and macula, spanning across papillomacular bundle (PMB) in OS. Patient underwent 25G Vitreous Surgery with ILM peeling and SF6 injection for OS. RESULTS: Macular hole was successfully closed at 4 weeks follow up and BCVA improved to 20/20. There was no postoperative complication CONCLUSION: We report that Traumatic macular holes with associated choroidal rupture running through PMB can be successfully repaired with Vitreous surgery and these eyes may achieve good visual outcome. 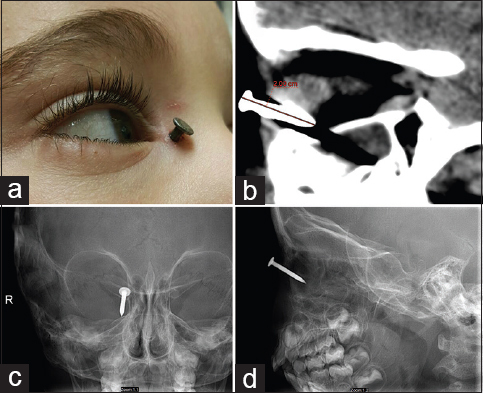 We describe a case of a 28-month-old boy who presented to our emergency department with a right orbital penetration by an iron nail. At presentation, no pain or functional loss were noted. Plain head radiographs and computed tomography were performed and demonstrated a two centimeters long nail penetrating the right orbit. The foreign body was extracted carefully in the operating room. No complications were observed upon follow-up. Rarely, orbital penetration by an iron-nail can present without functional disturbances or pain and is not necessarily accompanied by sequelae. We describe a novel technique to bleb needling by injecting subconjunctival ologen through an intraocular lens (IOL) delivery system to modulate wound healing in a failing filter. Bleb needling with 26G needle was performed, followed by subconjunctival injection of a biodegradable collagen implant using an IOL delivery system with cartridge in two eyes with a failing filter and high intraocular pressure (IOP). Postoperatively, the bleb was diffusely elevated, and the IOP was maintained between 10 and 14 mmHg at 6 weeks, 3 and 6 months follow-up. Therefore, bleb needling augmented with a biodegradable collagen implant inserted through an IOL injector system is a useful option in the management of failing filter posttrabeculectomy.